Taking a break after a long day of work in a winery bar is a great way to relax and socialize with your family and friends. Nothing can beat the best taste of wines, it can lift your mood and make you feel warm. Alsco is pleased to share to you the amazing story of Cupitt’s Winery – go behind the scenes, into the cellar with the Cupitt family to understand the secret of great wines. Cupitt’s Winery, tucked behind Milton on the NSW South Coast, is a boutique winery, microbrewery and restaurant. 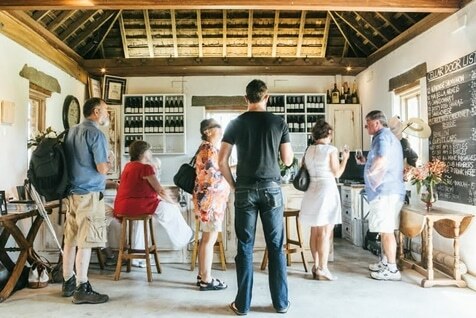 Pay a visit today to taste their award-winning wines and craft ales, learn about the wine-making process, or enjoy a special dining experience with a French accent, sample local produce and take in the extraordinary views across the vines to Burrill Lake and the Budawang ranges. They have been using Alsco’s linen for quite some time now. 1. How did your business come to life? Cupitt’s Winery was born of passion and the Cupitt family remains dedicated to providing the best wine and food experience on the NSW South Coast. Rosie and Griff Cupitt bought 193-acre Washburton Farm in 2003, with an eye to running a small cattle farm. Rosie, a trained horticulturalist, had built on her love of gardens by beginning a degree in viticulture and then moving into viticulture and wine-making. She decided she’d like a small vineyard and winery. The couple decided that they would both follow their passions at Washburton Farm, – and Cupitt’s Winery was born. Today the vineyard grows Semillon, Sauvignon, and Verdelho grapes while the farm specialises in Black Angus Cattle, and the herbs and vegetables used in Cupitt’s Kitchen. The restaurant began as a small addition that helps introduce their wines to people, however with a focus on local food and the culinary talents of Head Chef Russell Chinn the popularity of the restaurant has exceeded expectations. A visit to Cupitt’s Kitchen has become one of the must do options for foodies when visiting the regions. Rosie and Griff’s passion for food and wine were passed down to their sons, Wally and Tom Cupitt, who now make the wine. Libby Cupitt, formally a town planner, joined the team with Tom and is the restaurant manager and events coordinator. Today, Cupitt’s Winery regularly wins awards for both its hand-crafted wines and the fresh, innovative food served at Cupitt’s Kitchen. Visit to taste award-winning wines, learn about the wine-making process, enjoy a special dining experience, sample local produce, and take in the extraordinary country views. 2. What’s the best compliment you got from a customer? ‘That is the best beer I have ever tasted – ever! And Cupitt’s is my most favourite place in the world’. 3. What are the top 3 things you do to have fun at work? Tasting menu dishes with different wines to find the perfect match to go on the menu. Tasting wine from the barrels and during wine trials to work out the way to improve the wine. Riding the four-wheeler to go forage for natives for the restaurant or just to check out the amazing view from the other side of the farm. 4. What’s your top secret marketing tip that you can share with newbies? Social Media is free and a wonderful way to connect with your customers. We can show off the beautiful venue and food in ‘Instagram‘ and market our events through ‘Facebook and Twitter‘. We also believe in recognising our customers and use reservation software to track repeat business. We believe that a great database is essential to keep people informed on what happening and encourage them back to Cupitt’s. We have great relationships with other tourism operators and work with our ‘competition‘ to market the area as a food destination. The South Coast Restaurant Alliance is an initiative of four excellent restaurants in our local region who collaborate on marketing the region and putting on joint events to bring attention to what we have to offer in the region in the way of food, wine and produce. 5. What spectacular awards or recognition did you receive for Cupitt? The 2015 Sydney Morning Herald Good Food Guide Chef Hat, Gold Medal Trophy in the Australian Highlands Trophy for 2013 Dusty Dog Shiraz. 6. Do you have a funny story to share about one of your experiences in the business? Prior to a wedding ceremony at Cupitt’s we had a bit of an emergency when the best man dropped the wedding rings down the slats of the deck. We had to get a drill and pull up the decking. It created extra nerves for the groom. 7. What’s the single most important reason for your success? We work hard! Cupitt’s is a family run business with 5 Cupitt’s working pretty much all the time. We believe our business has still not reached it full potential and determined to keep improving and developing what we offer. Also, Rosie and Griff Cupitt are entrepreneurs, I am sure we would not have accomplished so much without them being willing to take a few risks to get ahead. 8. What sustainability practices do you do in Cupitt? And how do you think these can help the environment? Our business was established on the principles of ‘Slow Food‘, which align closely with the Sustainable practices. Growing grapes for wine and making the majority of all the beer and wine sold in the restaurant on site in our winery and brewery. 9. If you were not a business owner/entrepreneur right now, and you’re part of Alsco’s team, who would you like be? I would perhaps be an accounts manager so I could go around and visit all the great restaurants. 10. If Alsco is to offer your business a 1-year full service of one of our products, what would it be? And why do you like it best? It would be either the napkins or the tea towels because we use so many of them. I will go with napkins. Alsco would like to thank Libby Cupitt, of Cupitt’s Winery for sharing their story on how they became successful with wines. Occasions like weddings, birthdays, holidays, job promotions, company success and more will not be complete without wines. Your restaurant will look good when you also use linens that can help your place look inviting and pleasing. Alsco is a premier supplier of food and beverage linens that can add character to your restaurants, clubs, cafes or wine tasting rooms. Know more of Alsco’s linen by calling us now – 1300 659 892!